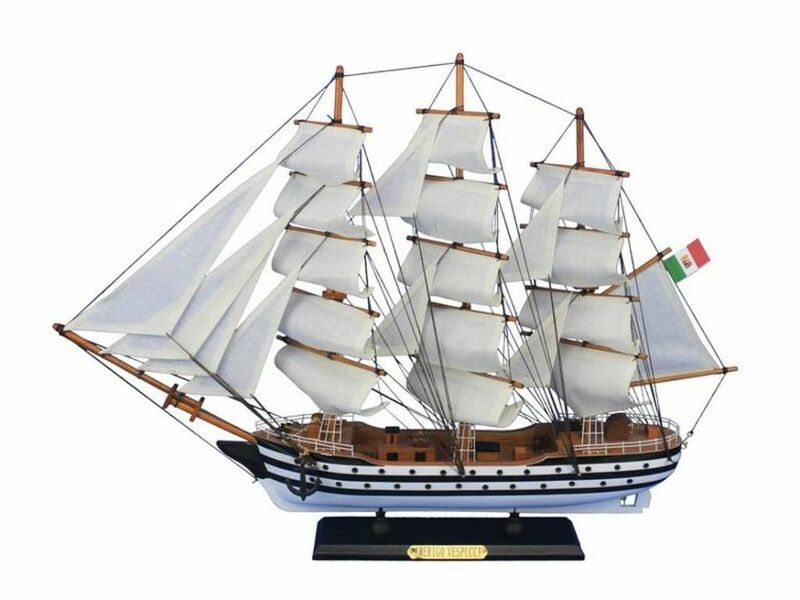 Perfectly sized for any small shelf, desk or mantle, these fine tall ship models of the Amerigo Vespucci are historically accurate scale model replicas of the famous tall ship. Add a flair of nautical décor to a den or living room, touch of history to a child’s bedroom, or an indomitable winning air to any office or boardroom. The Amerigo Vespucci is a tall ship of the Marina Militare, named after the explorer Amerigo Vespucci. Her home port is Livorno, Italy. As of 2005, she is still in use as a school ship. The three steel masts are 50, 54, and 43 metres high, respectively, and carry sails that total 2824 m² (30400 ft²) In total, the Amerigo Vespucci has 26 sails — square sails, staysails, and jibs: all are traditional canvas sails. The rig, some 30 km of rope, entirely uses traditional hemp ropes, too. Only the mooring lines are synthetic in order to comply with port regulations. Currently, she is the only existing three decked square rigger. The hull is painted black with two white stripes in reference to the two gun decks of the original ships the design is based on, but of course she carries no guns. The deck planks are of teak wood and need to be replaced every three years. Bow and stern are decorated with intricate ornaments; she has a life-size figurehead of Amerigo Vespucci. The stern gallery is accessibly only through the Captain's salon. The standard crew of the Amerigo Vespucci comprises 16 officers, 70 non-commissioned officers, and 200 sailors. In summer, when she embarks the midshipmen of the Naval Academy (Accademia Navale), there's a total crew of about 450 persons aboard. 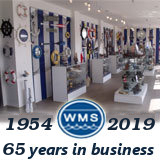 The ship has two diesel electric auxiliary engines, which together produce about 1471 kW (2000 hp), and a twin steering. When carrying cadets, she is usually steered at the manual stern rudder station, which is operated by four steering wheels with two men each. At other times, the hydraulically assisted steering on the bridge is used. Except for the anchor winch, the winches aboard are man-powered. The bridge is equipped with sophisticated modern electronic navigation instruments. Except for the time during the second World War, the Amerigo Vespucci has been continually active. Most of her training cruises are in European waters, but she has also sailed to North and South America, and navigated the Pacific, too. In 2002, she undertook a voyage around the world. The Amerigo Vespucci often participates in sailing parades and Tall Ships' Races, where she is in amicable rivalry with the Gorch Fock. When she is berthed in a port, public tours of the vessel are usually offered.